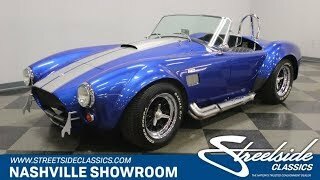 Hi, I am interested in your 1965 Shelby Cobra (stock #1289-NSH) listed on Autotrader for $38,995. I'd like to get more information about this vehicle and confirm its availability. If you want a visceral driving experience, then you should consider this Cobra replica. You feel alive when you roll down the road in one of these. There is a feeling of connection with the legend of Carroll Shelby and driving one is a feeling like no other. The power to weight ratio is incredible, so if you choose to cut it loose, it can really throw you around. The shape of the car is immediately identifiable, even by those who are not Shelby aficionados. If someone doesnt realize what it is, its all that much more fun to have the conversation. The one about how a little British sports car became an icon of American ingenuity and defeated the factory backed racing teams from Europe by stuffing a V8 engine under the hood, flaring the fenders and squeezing some serious rubber underneath them. This one is coated in a beautiful shade of Blue with Silver racing stripes that are painted on. Lots of air gets in through the large opening of the grill for the radiator and there is a scoop on the hood too. Vents in the front fenders just below a red, white and blue Ford badge give the hot air a place to escape. Also, it doesnt get much more awesome than having chrome side pipes running along the rockers and the sound they make is beautiful music. The interior of this car is pretty spartan. It is representative of the purpose for which it was designed, which was winning races. There is nothing there that doesnt need to be, and what is there is quality equipment. The bucket seats are simple but comfortable and supportive in pleated vinyl with wraparound side bolsters on the back. A beautiful wooden steering wheel is mounted on a three spoke hub with the iconic Cobra badge as a center button. The dash is filled with Autometer gauges to keep track of critical engine functions with the tachometer mounted prominently within easy view of the driver and a speedometer that sweeps in the reverse direction, just like in the originals. The shifter for the manual transmission sweeps forward which is also true to the original design. There are provisions for racing harnesses built into the roll bar and a fire extinguisher too because they were mandated in the original race cars. Open the hood and you will find a healthy Ford 302 cubic inch motor nestled down in a neat and clean engine bay. A black Edelbrock air topper feeds an Edelbrock 4-barrel carb and polished intake manifold. Black and brushed aluminum valve covers help some with oil cooling and feature Cobra in big bold letters. Headers wind their way out the side of the engine bay to the side pipes which sound awesome and help keep the car nice and low to the ground. Accessory mounts and pulleys are machined out of billet aluminum and the reservoirs for the brakes as well as the clutch are mounted off to the side away from the heat of the headers. Power flows back through a 5-speed manual transmission and 4-wheel disc brakes insure that you can haul this car back down from speed if you decide to let the horses run. Cobra center spin knock off wheels complete the picture and the rubber meets the road through 295/50R15 Cooper Cobra radials in the back and 235/60R15s in the front. Come on down and check out this tribute to an American racing legend. Both the man and the machine. These cars are fun to drive because of the reaction they get from people who see them driving down the street, and also from the feeling you get when you drive one.